When I was in second grade, my class studied whales. We each got to pick a specific whale to specialize in, but we also studied whales in general. We took some really cool field trips to areas where we were supposed to see orca whale pods that never actually materialized—but we had loads of fun, and we played with jellyfish and tidepool crabs and generally managed to still learn a lot. Much of which I still remember, if you feel like quizzing me! My whale was the coveted narwhal—coveted of course because of its similarity to a unicorn. In case you were wondering, most second-grade girls LOVE unicorns. (Heck, the boys probably liked ’em too, but I was the big Unicorn Whale Winner that year.) I was SO STOKED! I think I liked narwhals EVEN BETTER than unicorns! I of course wanted one, but in a narwhal instead of an orca, duh. I wanted this badly, despite my not considering the factors a) that the narwhal was much longer proportionally, especially when you included its horn; and b) that in fact the cool toy-rendered spinny motion was not a natural behavior for either species of whale. 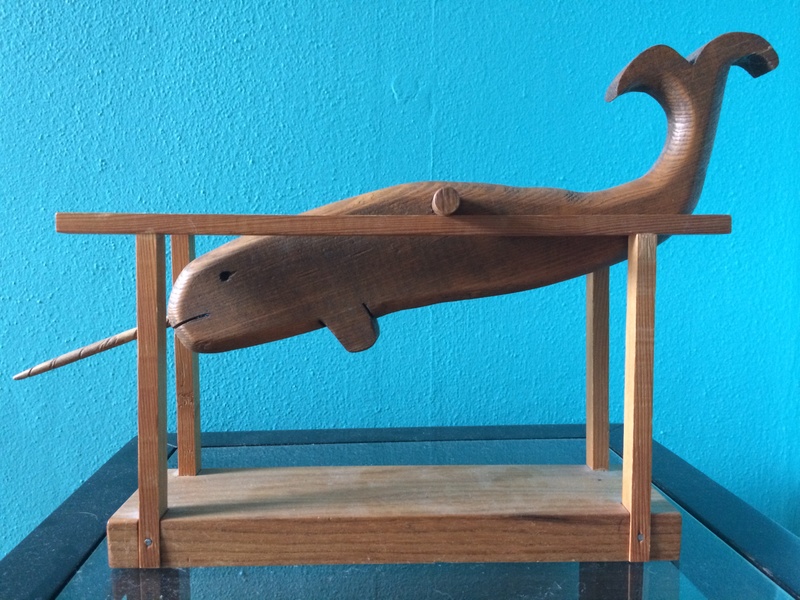 No matter; I wanted a spinny narwhal toy, and my father was a hobbyist woodworker who was delighted to potentially grant his daughter’s wish. So Dad and I set about making our own narwhal version of this toy. Well, first of all, I failed to articulate that the orca toy had been painted, so all of its black and white detail showed. The narwhal isn’t nearly as high contrast or recognizable in its markings as the orca is, but I still probably envisioned a dappled gray end result with a stained ivory tusk. Instead we did the whole thing in some sort of soft wood, with a walnut stain effect. It turned out lovely, but eight-year-old me was probably confused as to why it didn’t look more like the toy I had remembered and (to my mind) faithfully described. Second of all, there was no internet. This was in the late 80s, and we couldn’t just Google up a narwhal’s dimensions. So I think we either winged it, or *maybe* dug around trying to find a relevant National Geographic before winging it. Some sort of Encyclopedia Britannica or Commodore 64 action may have been involved as well. In the end, the narwhal we produced had a tusk that was much shorter than a faithfully realistic narwhal model’s would have to be. I don’t think I even noticed this as a kid, but I can’t help noticing it now, haha. Interestingly, Dad actually added in a few improvements. That textured detailing on the horn was pretty painstaking, I’m betting. That’s true to form and outside the scope of my original vision/request. And see how he used a router to round out the edges of all but the tail and fin spots? That gives the whole thing more depth and dimension than I had envisioned; the orca I was modeling my request after was more 2-D. It was flat on both sides and maybe a centimeter and half thick in the middle. None of the edges were rounded like this; any dimension on the orca came from paint rather than actual texture or form. I absolutely treasure my adorable little narwhal model now, and I’ve had it on display in every home I’ve lived in as an adult. It (he, I think) gets lots of compliments. But I still think it’s an amusing window into how the design process can go very wrong. (Note that I’m not a designer at all, and neither is my dad; I’m just amused to ponder this as a Pretend Case Study.) I want to make clear that I don’t intend to take away from the awesome work of my wonderful father, whose generosity and joy in creating cool woodworking items lives on. But let’s put on our Design Hats break down where we went wrong if this had been an official modern adult design transaction. 1) I failed to articulate my needs. I wanted some very specific elements to be included, like paint and functional motion, but I didn’t specify them, and my dad as a non-designer didn’t know how to ask questions that would draw out a complete spec. He worked with the vague picture I painted and he created a mental picture from scratch based on my youthful ramblings. 2) We failed to adequately research. Between the two of us, we probably could have come up with some data point indicating that the narwhal’s tusk would have to be n percentage of its body length; we then could have figured out how much space it needed to clear in order to turn an orca-like revolution. 4) We both allowed design assumptions to be made, without checking in. Dad actually did something much more elegant than the orca; he rounded the edges of all but the tail on our narwhal. This is way more sophisticated and realistic-looking than the more 2-D orca toy which inspired the project. But he also assumed stain was fine, he assumed the dowel placement didn’t matter, and he assumed the piece was more for display than for toy-like use (I think). I assumed he could read my mind. These are all interesting problems that I imagine actual design professionals face. I myself am learning to define my intentions, articulate them better, and check in more regularly when I hire creative vendors for my online dating coaching company. What say you, Actual Design Professionals? Have you run into anything like this with a grown-up client? My AltConf 2016 talk: Sell Out and Save the World!